Sorcerers’ aspirations are to reach infinity, and to be conscious of it. The task of sorcerers is to face infinity. They plunge into it daily, as a fisherman plunges into the sea. It is such an overwhelming task that sorcerers have to state their names before venturing into it. In this manner, they assert their individuality in front of the infinite. What makes human beings into sorcerers is their capacity to perceive energy directly as it flows in the universe. Human beings are not only capable of seeing energy directly as it flows in the universe, but they actually do see it, although they are not deliberately conscious of seeing it. “Awareness” is energy and “energy” is constant flux, a luminous vibration that is never stationary, but always moving of its own accord. 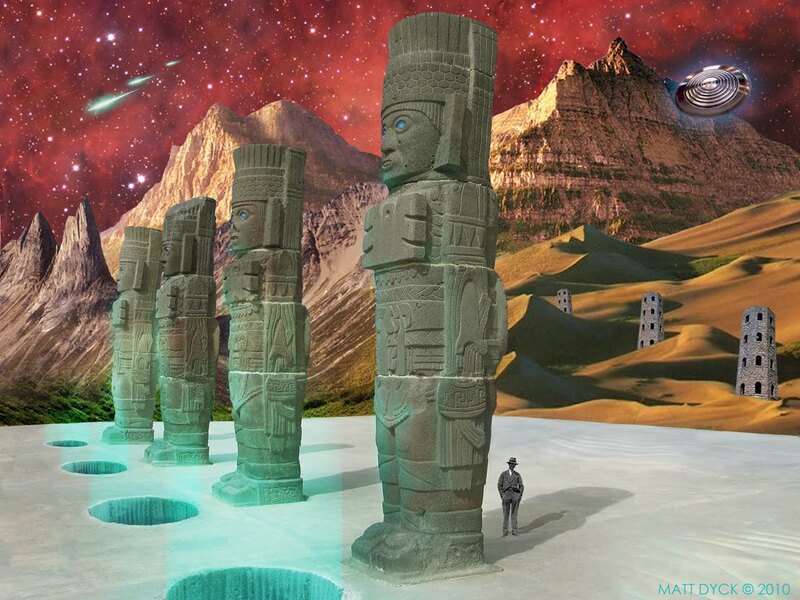 A Nagual’s dream ~ The Warrior’s Journey – The quest for knowledge leading into the heart of the unknown. A visual and auditory landscape – a dedication to all those who faithfully follow the path with heart without rushing or faltering. The most demanding aspect of the teachings of Don Juan Matus, is in regard to the duality of the warrior; how is it possible to reconcile the two halves of our double nature that comprise the whole. Our dual nature is at best both an advantage and something of a burden… it can inhibit our actions and cloud our judgement at times. The balancing of the two sides of our being is the answer to this dilemma. Don Juan makes it clear that all that remains of the Toltec teachings is in a sense ‘stalking’ and its counterpart ‘dreaming’. A warrior follows the rule of the stalkers. The Rule applies to everyone but the stalker takes it on as the only means of buffering the onslaughts of power that come in the pursuit of knowledge. The rule is that a warrior has essentially given up the concerns of his everyday life in the pursuit of knowledge. He is only interested in unravelling the mysteries of the universe. He must come to the understanding that this mystery is infinite, and as such this is a hopeless task but he must proceed anyway. In doing so the warrior becomes a part of the mystery themselves – everything within his universe becomes equal unimportant and as to nothing. This principle is the Rule of stalkers. Don Juan also outlined the mood for stalking this being:- Ruthlessness, Cunning, Patience and Sweetness. This is the guiding attitude a warrior needs to adopt to stalk effectively. One of the principle tools of stalking is recapitulation. This comprises the stalkers ‘sweeping breath’, the purpose of which is to free the warrior from the bonds of energetic filaments that become attached to them though energetic exchanges. The breath itself gives the life-giving healing force needed to purge the luminous being. The aim of a stalker is to lose human form. This is can be achieved through a powerful recapitulation followed by implementation of the not-doings of the self such as erasing personal history, losing self-importance and breaking of routines. The stalker is the epitome of a warrior in this way is both light and fluid. Free of human form the stalker is also unpredictable, deliberate in action, patient, not concerned about being understood nor concerned about the self-reflection of others – but instead this state allows the individual to be light-hearted and jovial and they truly enjoy their lives. Dreaming is built on the premise that there is something called the ‘double’ or the ‘other’ and this is a replica of the warrior themselves. The important aspect of this concept is in being able to comprehend such idea. ‘Will’ is how the dreaming double is accessed and channelled and through ‘Will’ the dreaming double can become anything. The knowledge of this opens us to the concept that what we are in fact is an energetic configuration of energy fields or indeed as Don Juan called it ~ the luminous being. The aim of the dreamer is to find themselves in dreaming. He achieves this with a simple manoeuvre; this is to find the hands in dreaming – which is to look down at the hands while asleep and to realize the dream state. The dreamer also hopes to actually see themselves dreaming. In this instant it is important to avoid the shock of experiencing such a thing. As with all things in dreaming the dreamer takes nonchalantly whatever he sees. The way anything is achieved in dreaming is through the volition of the dreamer. Once the dreamer has found their hands they next attempt to find a location within dreaming and with practice this can then be found in the waking experience. As with all aspects of Don Juan’s teachings “stopping the internal dialogue” through the process of Not-doing is a vital component of dreaming. Dreaming requires then a quickened mind and the energy saved from talking to oneself allows one to dream. What one seeks in dreaming is not what one would pay attention to in everyday life. The shift into dreaming is achieved by anchoring the double to the second attention that being the attention of the nagual, The assemblage point makes a natural shift into this left side of awareness when one sleeps. The trick being to store attention in dreaming ~ this is to become totally immersed in the dream to the extent that one is totally detached from the waking experience. There are seven gates of dreaming that must be crossed for the dreamer to gain mastery over their dreaming. The first gate of dreaming is to gain control of ones attention in dreaming. The easiest way of doing this is through finding the hands in dreaming, this anchors the double in the second attention. The second gate of dreaming is to learn how to wake up in the dream into yet another dream – enabling the dreamer to change dreaming locations entirely. The third gate of dreaming is reached when you find yourself staring at someone in a dream and that someone turns out to be you. There are two stages to this gate. The first stage, is to arrive at the gate; the second is to cross it. By dreaming that you see yourself asleep, you arrive at the third gate. The second phase is to move around once you’ve seen yourself asleep. The Fifth gate of dreaming is to be able to bring out the dreaming double in everyday life. And the seventh is to be able to transcend the world entirely and to step beyond this world with the totality of oneself. It takes years to master the arts of stalking and dreaming – it requires perseverance and only then comes about by practicing the disciplines that Don Juan prescribed. I have found that remembering direction is a key element. Not only in terms of a long perspective but on the basis of moment to moment orientation (in all planes of being simultaneously). Balancing ourselves and the forces in our world is also of prime importance. Understanding the relativistic and dualistic nature of reality. And coming to an understanding that nothing essentially matters except perhaps the rule. Once we set out on this path there really is little alternative – when one begins to comprehend the knowledge it cannot then be unlearned, only expanded upon. One may run away but this is not the path with heart and ultimately you will have to pay for this. Understanding the concepts of control folly and controlled abandonment is key. In regard to stalking controlled folly is our shield and guards us against the rigors of power. Control abandonment Don Juan describes as being something simple and ‘there being nothing to it’. But controlled abandonment is in principle the art of sorcery specifically in the application of dreaming – the ability to acquiesce to the situation – to know how and in what proportion. We require both Controlled abandonment and controlled folly in both waking and dreaming – being able to give ourselves to the moment and in the same instance able to act to produce the best possible outcome. A life lived like a warrior is unsurpassed – one becomes the master of oneself – the ego being defeated along the way. But as Don Juan says this can only be achieved without either rushing or faltering. The abstract will be achieved in time if one holds firm to the path with heart. But in the end reaching the spirit means there are really no devices one can cling to, no object, and no person. We have in the final outcome the say over our lives – it is our decision. I first found my hands in dreaming about 12 years ago. It was not for a want of trying that it took me so long to achieve. I would practice setting up dreaming before falling asleep most nights, I would remind myself that the purpose of my dreaming was to find my hands, I would often wear a dreaming headband, and attempt to watch myself falling asleep. I invested in a Spirit Catcher and kitted it out with a Quartz, I even tried attaching a quartz crystal to the top of my head while sleeping, as recommended by Don Juan. The results were pitiful however. Nightly I would fall asleep and enter dreaming. I was dreaming frequently and fairly lucidly at the time, but at no point would I remember the instruction to find my hands. It seems I would never become aware enough that I was actually within a dream. I was getting close however I felt a tension was starting to build within my dreaming experience. There was one dreamscape/location, I kept returning to. I would be standing outside of a house, aware vegetation was growing out of it; perhaps a plant or tree, something that seemed very familiar to me. I would be standing on a path that led past the bay windows of the house, I even remember looking in on one occasion. I could not make it any further up the path however, something would end the dream. But it was in this location that I eventually managed to realise that I was asleep which prompted me to act – and I found my hands. The process was initially that I looked straight ahead – in awe of the fact that I had managed to realise I was dreaming. I felt very alive at that point, I could even feel the gravel of the path beneath my feet and realise I was somewhere else altogether. I then immediately looked down at my hands, inspecting them – the lines on my hands seemed to jump out at me. I became engrossed in studying my palms then turned them over…. At that moment the dream location changed. I cannot recall how many locations I travelled to. I seemed to be flying from one to another. Various things were happening at each location I found myself in, but I was limited by the amount of time I was there to how much I could recall. The general theme was that I was on a ‘night out’. I do remember going with friends to a bar, being thrown out then stumbling away down the street. But with this like all the locations I travelled to, I would suddenly be whipped away and would ‘fly’ somewhere else. I ended up in an alley, looking down at myself from above, but aware at the same time that it was myself I was looking at. Presumably exhausted by my night-time aeronautics I sat there till the friends I had been drinking with turned up to collect me. At which point I awoke, in astonishment and particularly happy with my success. “You must start by doing something very simple,” he said. “Tonight in your dreams you must look at your hands.” I laughed out loud. His tone was so factual that it was as if he were telling me to do something commonplace. “Why do you laugh?” he asked with surprise. “How can I look at my hands in my dreams?”..